Electric Paradise Music Festival, located in the Dominican Republic, announces its full 2015 lineup featuring Skrillex, Nicolas Jaar, Steve Angello, Guy Gerber, Martin Garrix and more. On 19 December, the multi-stage, multi-genre and multi-sensory festival, located in Punta Cana, will be welcoming an eclectic array of 20+ music artists for its 2015 edition, just steps away from what many apparently consider to be one of the most beautiful beaches on Earth. In addition to music, Electric Paradise will also offer art, food, design, technology and story-telling. As the first festival in the country to feature simultaneous stages, and apparently the biggest festival in the region. After initially announcing everyone from the Major Lazer to Hot Since 82 in the phase 1 lineup, and acts like Nicolas Jaar, Guy Gerber, and Matador shortly after, the festival rounds out its bill with possibly some of the most in-demand artists in the scene, such as OWSLA's Skrillex, Mad Decent's Diplo, Dutchman Martin Garrix and more. In addition, the festival also features a handful of the top local acts, including Lash, young gun, Dav Motta and more. 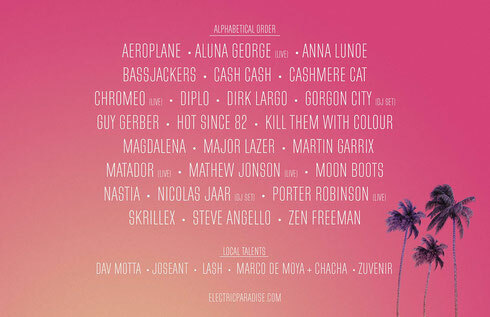 For more information check: www.ElectricParadise.com.